For the next couple months, I will be working on birthday gifts and baby shower gifts. 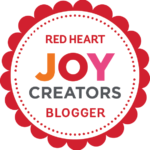 I will do my best to either write up what I make or review and link the patterns I decide on. This is going to be a fun summer in my little crochet world so make sure you follow Stitch11 on Facebook! This hat fits most heads 5 years and up! Although it won’t fit all adults, it fits me great. If you are wanting to make it for a larger head just add an extra increase round. 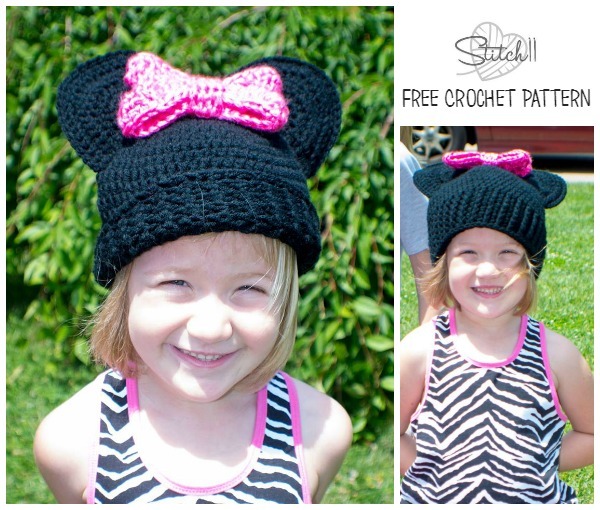 If you want it for someone younger than 5, check out my Preschool Minnie Mouse Hat pattern! It’s free as well. #5 Pink Bulky Weight Yarn and a 6.5 mm crochet hook for the bow. For THIS bow, I actually used two strands of Caron Simply Soft held together. Layer 2 ears together and join from one side to the other with the Single Crochet stich. No need to join the bottom, you will do that when attaching it. This will make it a thicker and stronger ear. Attach the ear to the hat and repeat for other ear. I attached my ears across rounds 2-9. Now all you need to do is make your Minnie Mouse Bow and attach it in front of your ears. For the bow in the picture, I used two strands of pink Caron Simply Soft held together. Using a yarn needle and yarn. Hi. I had used your princess hat w/ braids & crown pattern previously to make a rapunzel type hat for my 3 yr old (which she loved!). Tonight when I came back to visit it was like destiny to find the mouse hat pattern…we head to Disneyland this Saturday. I hope to get 2 done before we leave, one for each of my girls (3 & 6 yrs). I would like one for me too, but I don’t know if that will happen. My question is regarding #14 on the hat…is the total count actually 57 or 58? You say to do 1 hdc into next 56, then do 1 sc and a slip st (not sure if the slip st is counted). I just want to make sure I am on track.